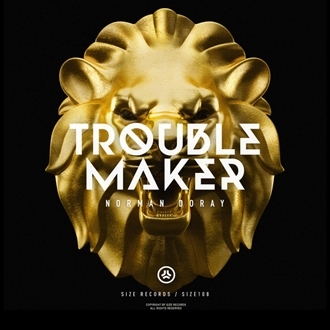 First aired during Steve Angello’s recent BBC Radio 1 Essential Mix earlier this year, Norman Doray’s latest single ‘TroubleMaker‘ quickly caused a whirlwind of excitement and anticipation. Building on the success of recent single ‘Filtré’, his first original material of 2013, it is set to continue a big second half of the year for the French DJ and producer. Marking a return to Size for the first time since ‘Celsius’ with Eddie Thoneick last year, ‘TroubleMaker’ further explores Norman Doray’s unique style and infectious sound, a record fully equipped with euphoric melodies and electro-infused drops. From high-pitched, heavyset synths to big room crescendos, ‘TroubleMaker’ is a perfect example of the potency of Norman’s immaculate peak time sound. Having earned his stripes on the club circuit, Norman’s productions have been released by some of the most important labels in electronic music. As well as Size Records, Axtone, CR2, Strictly Rhythm, Warner Music, Atlantic Records and most recently LE7ELS have all helped to spread Norman’s music around the globe, while his productions consistently occupy the Beatport Top 10. Along the way, Norman has also collaborated with the scene’s finest talent: he has co-produced with the likes of Arno Cost, Avicii, Tristan Garner, Albin Myers and David Tort whilst remixing the likes of David Guetta, Dirty South, Laidback Luke, Tony Braxton and many more. Each of Doray’s releases continues to make headlines as he forges his path to the top, and none more so than his latest offering, ‘TroubleMaker’.